My daughter, a soon-to-graduate senior in high school, is taking a well-deserved change this last trimester. We purposefully encouraged her to cut back formal high school learning (which she eagerly accepted) and instead, to set up a trimester learning about things she wants to in ways that work for her. (Perhaps I will blog more on this plan in the future.) Less homework and less structured activities has not, as I feared, led to a rampant increase in Netflix. I heard her playing something this morning that I didn’t recognize. As I walked into the living room, I see her with her iPad on the piano. She found an app that had guitar chords and the lyrics for hundreds (probably thousands) of songs. She was taking this info and playing them on the piano. 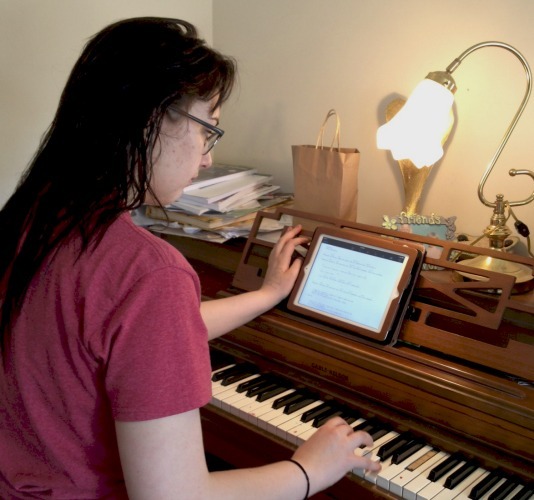 She was having to refresh her music theory skills to remember all the chords, figure out the melodic line and then make the songs more complex by changing the chords. Definitely a worthy learning experience, and a lovely accompaniment on a Sunday morning!